Cuddle up with the terrifying animatronics from Five Nights at Freddy’s! 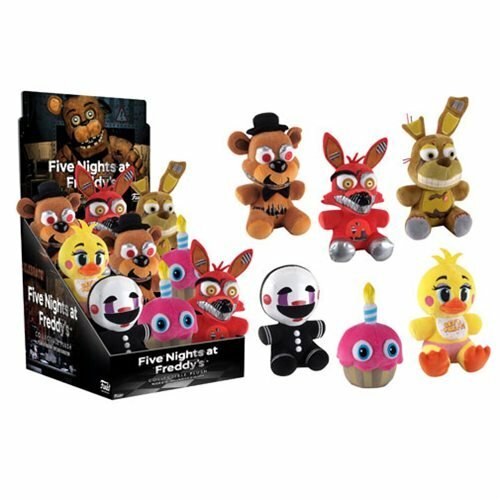 This Five Nights at Freddy’s 6-Inch Plush Display Case features some of your favorite characters from the hit survival-horror game. Each plush stands approximately 6-inches tall. The display case contains 9 individual plush and contains the following (subject to change): 2x Nightmare Freddy 2x Nightmare Foxy 2x Cupcake 1x Nightmare Marionette 1x Springtrap 1x Toy Chica Ages 8 and up.